Finally, a book to put you over the edge. "It was the best of times; it was the worst of times." Okay, it was simply the worst of times. Yes, we woke up on January 20, 2017 to a new reality or a new false reality. We had a new administration, a new sheriff in town and a new need for mental health assistance for lots of Americans. Some turned to the usual forms of getting through challenging times: heavy drugs, guzzling wine, bleating on one's Facebook page, prayer, shopping, yoga, meditation, grand theft auto, binging on videos, eating gallons of ice cream or pursuing all of these activities at once. Since these usually helpful remedies now no longer seem to work, the two authors (formerly incarcerated at a black site) thought they should be of further assistance. 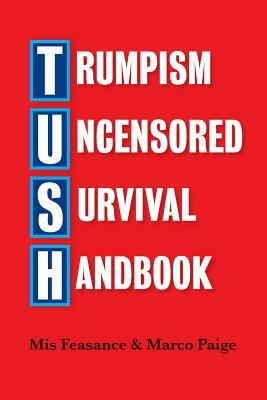 They have created a special handbook for these unique times: the Trumpism Uncensored Survival Handbook (TUSH). This book provides a range of anecdotes, crazy apps, surveys and other humorous takes on the current political era. It's the perfect antidote for all the bad news, faux news and expos's that Americans face as they wonder, "Will democracy survive another week?" TUSH includes a number of items for sale - things you definitely need or not, like the Big Pharma calculator, Faux Pas e-greeting cards or the handy Go Frack Yourself kit. Finally, TUSH has lots of illustrations, in this awesome and carefully curated handbook, for those who like to avoid words on a page.